by Keith Anderson. Morehouse Publishing Co., 2015. What if your congregation wasn’t primarily represented by its building? What if your congregation was primarily represented by its relationships? Lutheran pastor Keith Anderson wants you to consider your neighborhood as sacred space. He wants you to think of the network of relationships your congregation hosts as holy ground. 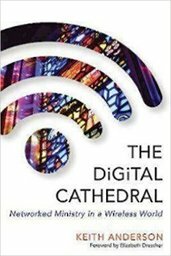 He has carefully chosen the medieval reality of the cathedral as an image for twenty first century ministry because the expansiveness of architecture design - so welcomed centuries ago - invites consideration of the expansive web of relationships that sustain and extend a religious community. Think metaphorically of what it would mean if your congregational building didn’t fold within itself. Instead, imagine ways that your faith community extends far beyond your sanctuary. Years ago, it took an entire community of workers a lifetime to build a cathedral. To what kind of life is your congregation aspiring? If you are a congregational leader that thinks creatively, or if you are wanting leaders to think about congregation in new ways, this book is a discussion starter. It offers a firm foundation for thinking about the location of the sacred.